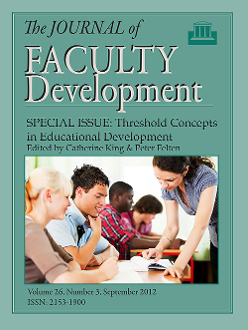 In this special issue the editors and contributing authors explore the idea that the field of educational development has threshold concepts: ideas about teaching and learning that have the power to transform the way educators understand the teaching and learning process and their role in it. J. H. F. Meyer and R. Land initially developed the threshold concept framework to describe aspects of students learning in economics in University settings in the United Kingdom. Since then, the framework has been applied to a wide range of disciplines, providing a heuristic for faculty to explore their own disciplines from a student perspective, and to use the results to enhance their teaching and their students’ learning. The Threshold Concepts Framework acts as a catalyst in faculty development activities, energising and provoking discussion by faculty about their own courses in their own disciplines, and often leading to the discovery of transformational concepts that occasion epistemic and ontological shifts in their students. The present study focuses on faculty development programs where faculty are the students and provides evidence for variation in student learning as a threshold concept that for many faculty members transforms their conceptions of teaching, their identities as teachers, and their practice. A detailed discussion of the pedagogy used to achieve transformational outcomes is provided. Scholarly teaching, the act of systematically examining the links between one’s teaching and student learning, remains a challenging idea for many faculty members. We argue that two threshold concepts - teaching as an inquiry-based process and teaching as a public act - serve as powerful hurdles to the more wide spread adoption of scholarly teaching approaches in higher education. In this article, we discuss why these pedagogical frameworks serve as threshold concepts, as well as methods that we have devised to support faculty members’ development of a more scholarly approach to their teaching. Even though many curricula are built on a foundational assumption that students will transfer knowledge from one course to the next, faculty often struggle with teaching for transfer. This article introduces the design of courses for transfer as a threshold concept that is conceptually difficult and cognitively troublesome, yet potentially transformative for faculty. The article concludes with implications for faculty development, including strategies for remaining attentive to transfer goals. Using the Threshold Concepts Framework, I explore places where faculty frequently get stuck when attempting to adopt new technologies. They may be held back by preconceptions that technology is superfluous to traditional teaching methods or believe that they must understand the technology perfectly before introducing it into their teaching. Drawing on formal and informal sources of information, faculty developers can facilitate movement across these thresholds to the realization that experimenting with technology is a necessary approach to understanding how integral it is to the teaching and learning process. Requiring and fostering shifts in perspective, practice, and identity, the counter-normative pedagogy of service-learning can be challenging for faculty to learn. Meyer and Land’s (2003, 2005) work on threshold concepts may enhance understanding of the troublesome yet transformative nature of learning to collaborate reciprocally with students and community members. Students as Co-inquirers: A Requisite Threshold Concept in Educational Development? For over a decade, Western Washington University has sponsored the Teaching-Learning Academy, bringing students, faculty, staff, and community members together as co-inquirers into overarching questions about teaching and learning. In this safe space, participants frame one research question of interest each year; sharing their perspectives and lived experiences to create understandings about education that frequently rise to the level of threshold concepts. In this article we explore some of the results of the co-inquiry process, illustrating the important contributions students make to answering the shared questions and to translating the TLA findings into an enhanced institutional learning environment for everyone. Catherine King is the Associate Director of the Center for the Advancement of Teaching and Learning and an Associate Professor of Psychology at Elon University. Peter Felten is the Assistant Provost, Director of the Center for the Advancement of Teaching and Learning, and an Associate Professor of History at Elon University.